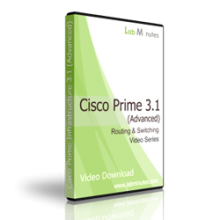 This video bundle features a complete video download set for Cisco Prime Infrastructure 3.1 (Advanced). With over 17 hours of lab video tutorial, you will be able to get up to speed and become more familiar with the technologies. Buy this video bundle and view them locally ad-free on your computer at your own pace without internet connection, and also save over 17%. This video bundle extends your basic knowledge and intends to help you get the most out of your implementation of Cisco Prime Infrastructure 3.x. The video series focuses on device configuration, advanced application monitoring, and integration with Cisco MSE and CMX. This bundle is perfect for network admins, engineers, and consulting engineers who already have some familiarity and are looking to unlock the maximum potential of the product for your and client's organization. Please note that this video bundle is not an introduction of Cisco Prime Infrastructure 3.x and a working knowledge with preferably a working production environment or lab setup are recommended before viewing these videos. If you are new to the product and looking to learn more of the basic features, Lab Minutes has a separate video series on Cisco Prime Infrastructure 3.x (Basic) that was designed for novice users. We recommend the first five videos to be viewed first as they serve as an introduction to device configuration. The remaining videos can be viewed in any order, although, due to how the labs are designed, they are best viewed sequentially.